Are Convertible Space Apartments The Next Big Design Trend? ROTHELOWMAN have collaborated to create a genuine innovation in the development and design of apartments. 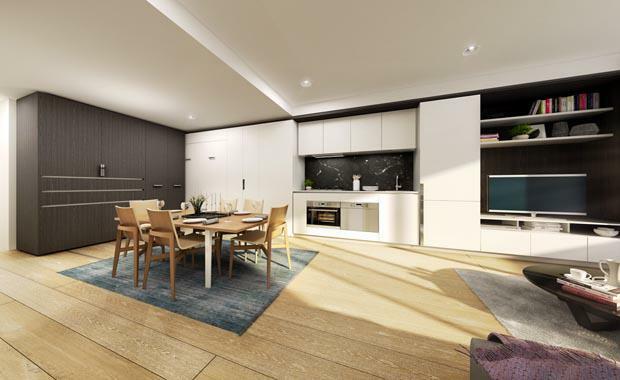 ‘Convertible Spaces’, at the luxury Sanctuary on the River development in Abbotsford, is a highly innovative one-bedroom apartment model, offering enormous flexibility and the power to transform your space to suit your lifestyle. Composed with a Scandinavian-inspired finishes palette, moveable walls, pull down beds and integrated joinery enable residents to transform their living area into a larger space perfect for entertaining or simply spreading out. Hamton Joint Managing Director Paul Hameister said they chose Sanctuary to debut the ‘Convertible Spaces’ as the vibrant Abbotsford precinct and premium riverfront location attracts young professionals and owner-occupiers. "These buyers want one-bedroom apartments with a layout that doesn’t restrict their lifestyle," he said. The ‘Convertible Spaces’ apartments at Sanctuary are priced from $415,000 to $455,000 with completion expected in Spring 2015. Having realised a number of projects together, from Eden, Haven and Sanctuary apartments in Abbotsford to townhouses in Richmond and Brighton, the ‘Convertible Spaces’ signal the latest collaboration between ROTHELOWMAN and Hamton. “We share a commitment to design innovation and quality”, said Hameister.